Three days before a week-long trip, I realized that I needed a new duffel bag. I’m not a fan of rolling carry-on luggage, and so I was looking for a soft-shell bag. 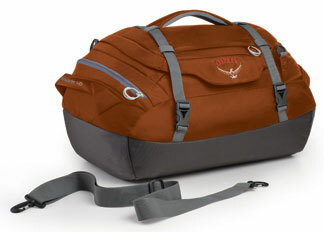 Osprey’s Transporter series 46-liter pack seems to fit the bill. The Transporter 46 is spacious and with generously large handles while being small enough to serve as a carry-on. This bag features a main compartment, one smallish end pocket, and a slim top panel pocket. It also includes a shoulder strap, or rather a thin piece of webbing that Osprey is calling a shoulder strap. All 3 of the larger Transporter bags include a backpack-style stowable harness instead of this strap. At only $55-65, the Transporter 46 is pretty reasonably priced. I’ll fill it to the brim and toss it around town for a week before reporting back with a review. If after testing the shoulder strap is the only issue, I believe that several companies sell just a shoulder strap—sometimes they have have that slideable extra cushion on them. When travelling with a Transporter 46 recently, I used a Domke Post Office Shoulder Pad on the strap, and it helped make the load a little more bearable. I did overload the bag a bit to the point (~30 lbs) where I don’t think any strap would have made a difference. To my delight, the hand straps were fantastically comfortable! I’m kind of curious to see how their Flapjack packs compare to Timbuk2’s and Yakpak’s shoulder bag offerings. Personally I’ve been known to kill the shoulder straps, handles, and even the strap mounts on bags of these varieties! The Osprey FlapJack looks pretty durable, but so are Timbuk2 bags. I can’t say for sure without seeing a FlapJack in person, but the pads seem to be wide and padded enough to support reasonably heavy loads. I’ll have to check out both. Though I figure to check out a Timbuk2 first merely because they’re a locally company (although they admittedly manufacture in Taiwan, Vietnam—though they manufacture locally as well).